Doncaster Rovers player Matty Blair was on hand as the participants of Fit Rovers course 10 achieved record results on Thursday night. Participants shed a total of 78.3kg, the most seen by a single course since the start of the scheme. This has taken the total weight loss of men on Fit Rovers since 2017 to more than 95 stone. They also lost 122cm from their combined waist circumference and drastically improved their mental wellbeing, which saw their total self-confidence rise by 64 per cent since week one. 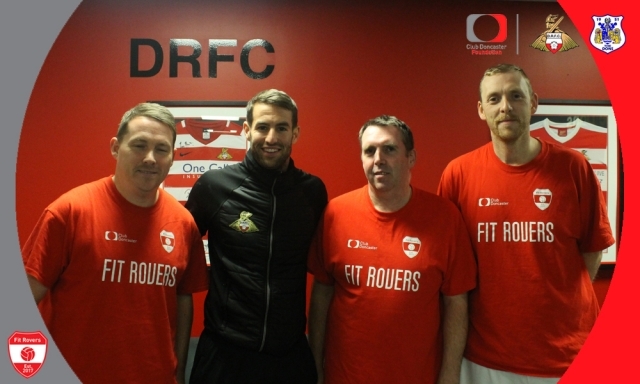 The participants were welcomed onto the programme by Matty, the Fit Rovers ambassador for 2018/19, eight weeks ago, and he was inspired by the commitment and personal drive from all those who took part. He said: “These guys inspire me. It is great to see so many people take part in such a worthwhile programme. Along with fantastic results, course 10 also achieved the highest retention rate, with 92 per cent of those who started the programme going on to complete it. Course facilitator Nick Gillott commented: “This brought a conclusion to our second year of Fit Rovers. Course 10 proved to be one of the most successful courses we have delivered in regards to weight loss and course completion rate. Unlike big fitness/weight-loss chains that charge you for public weigh-ins and give very little guidance, information at Fit Rovers is completely confidential meaning you can keep a track of exactly how you’re doing on a one-to-one basis with the dedicated staff team. One session a week for eight weeks is included in the course, as well as incentives such as sports wear, Doncaster Rovers player visits and money off match shirts. For more information on how to book onto the next free Fit Rovers course, which is scheduled to run in January, contact the team on 01302 764663 or alternatively at fitrovers@clubdoncasterfoundation.co.uk.